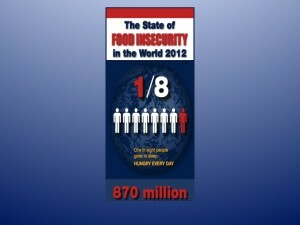 Every day 870 million people on the planet are hungry. When we consider feeding the world’s population, the goal is to provide adequate nutrition to everyone in the most efficient way possible. The production of beef, chicken, fish, eggs or dairy for consumption is a highly inefficient use of land and water and has an impact on world food shortages. 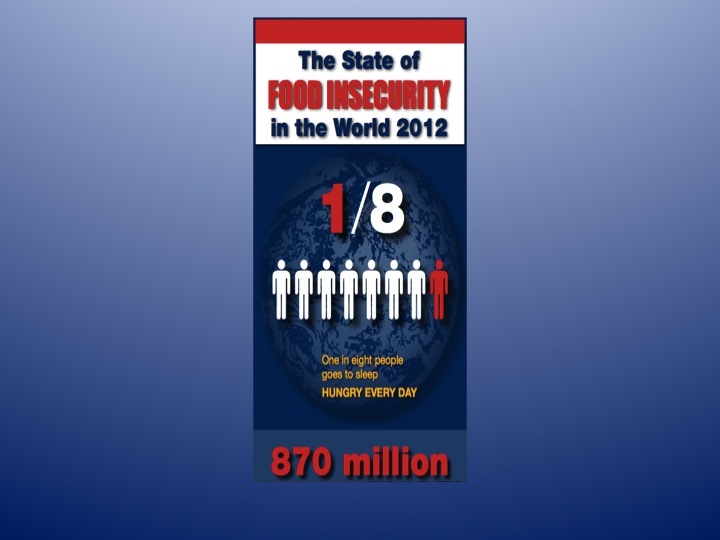 There are more than 7 billion people on earth and, according to the United Nations report published in 2012, 870 million are chronically undernourished. Some might wonder, what if everyone just ate plants? Would there be enough land to grow food? It takes an enormous amount of land to grow the food necessary to feed the animals we raise and eat. If we used the same land to grow food for the 870 million chronically undernourished humans rather than animals, it would allow for three pounds of plant food per day (which is twice the amount necessary to survive).